HITZ is Premiership Rugby’s award-winning education and employability programme which works with over 2,000 14-18-year-olds across England every year. HITZ uses rugby’s core values of teamwork, respect, enjoyment, discipline and sportsmanship to get young people not in education, training or employment (NEET) back into education, training, apprenticeships and/or employment, and is delivered nationally by England’s 12 professional rugby clubs. Having completed HITZ, Jade is currently training for a level 2 coaching qualification and with the help of Maggie Alphonsi, they delivered a coaching session for young girls associated with Bath and the Bath Foundation. 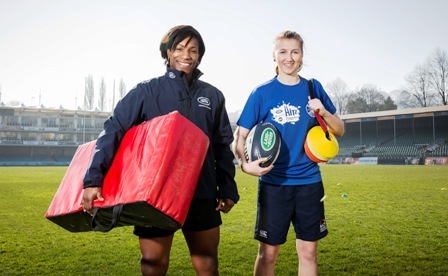 ENGLAND legend Maggie Alphonsi hailed the ability of the HITZ programme to empower young women after delivering a rugby session to celebrate International Women’s Day. The Women’s Rugby World Cup winner joined HITZ participant Jade Whale at The Rec, where they coached a group of young girls associated with Bath and the Bath Rugby Foundation. Supported by key partner Land Rover, HITZ is a national programme that uses the power of rugby to inspire and motivate young adults to get back into education or employment. Alphonsi praised the HITZ programme for showing young women that they can achieve anything they want. “What I love most about the HITZ programme is that it uses rugby to work with disengaged young people, it gives them confidence, it instills good values as well,” said Alphonsi, who was speaking on behalf of Land Rover during the HITZ session to celebrate International Women’s Day. “It allows them to believe that they can whatever they want and I think it’s quite a powerful programme that helps young people to get on the pathway to success. “Rugby pretty much changed my life in terms of giving me good values, discipline, respect, teamwork and I think it brings that to the young people involved in the HITZ programme. “They learn to be more respectful, they learn to be more disciplined and they learn to work together and work with people that they never worked with before. “I really enjoyed the session and it was absolutely fantastic to work with Jade as she is very knowledgeable and I’m learning some tips about how to be a good coach as well. “I love how she really engaged with the young girls as I think it’s important to have role models and Jade is very much one of those as her story is really inspirational. The social inclusion programme is run by all 12 Premiership Rugby clubs, using rugby to encourage young adults to engage with education, employment and vocational training. Supporting the programme since its inception in 2013, Land Rover has a heritage in rugby and understands the values of the sport that has the power to change young people’s lives. Before starting the programme, Jade had never played rugby before, had low self-confidence and struggled with situations she was uncomfortable with - but that all changed with HITZ. Jade started volunteering with the Bath Rugby Foundation during her time on the programme and progressed to helping out with mixed ability training sessions with Walcott Warriors. With her new-found self-confidence, she started playing for Bath Rugby Ladies and her remarkable journey was recognised last year when she won the HITZ Rugby Ambassador Award. And ahead of International Women’s Day, Land Rover Ambassador Alphonsi believes Jade’s story is the perfect example of the way HITZ empowers young girls through rugby. “What’s great about International Women’s Day is we get the chance to tell the stories of some fantastic individuals who are doing some amazing things and Jade’s is one of them,” she said. “Jade’s story inspires me so much, to think that’s she’s come from not being very confident to working her way through the HITZ programme and developing her confidence. “Now she’s playing rugby at Bath and working for the Bath Rugby Foundation and to me that’s absolutely brilliant, that story in itself can inspire so many people.